Date: 2-6 February 2018 (Waitangi weekend). Location: Lake Peel and Balloon Hut, Kahurangi National Park. 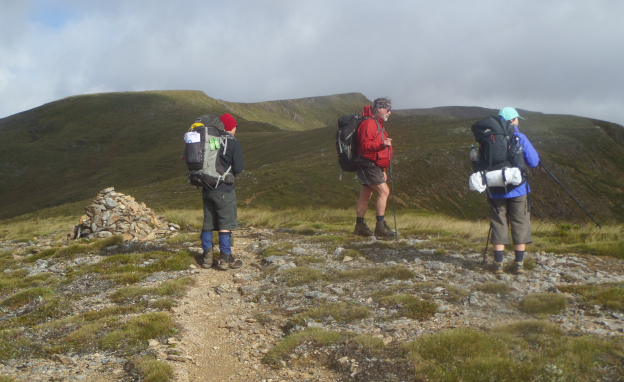 Trampers: Garth (leader), Carol, Jane and Phil. After leaving the ferry at Picton on Friday evening, we drove to Rai Valley hoping to camp in one of two spots for free camping. Alas, by 10 pm both sites were chokka with vehicles. Available spaces were small and sloping, and puddles plentiful. So we backtracked to the DOC campsite at Pelorus Bridge where we found lots of nice flat lawns and a modern kitchen, dining, and ablutions block. On Saturday morning we drove to the Takaka Hill Road and turned onto Cobb Valley Road’s long and winding route to the Cobb Valley Campsite. By the time we started up the track to Balloon Hut it was getting on for midday. 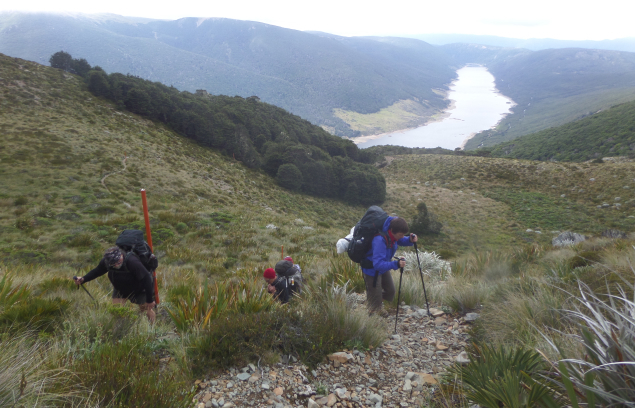 The track began at about 840 metres and zigzagged up to 1400 metres. But as this was an Easy trip we took it pretty easy and had plenty of stops to check out Mytton’s Hut, admire the view over Cobb Reservoir, etc etc. 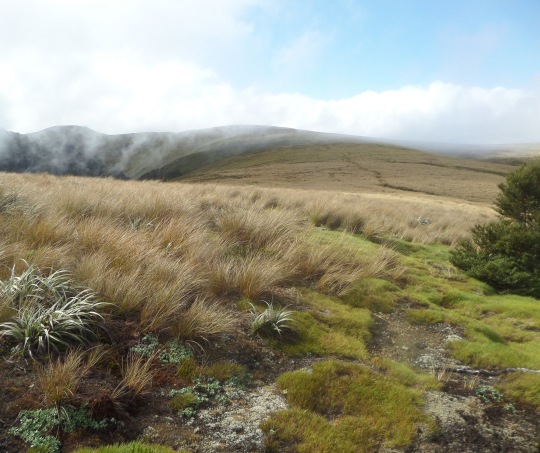 When we emerged from beech forest into tussock country the wind was stronger and cooler and low cloud shrouded the tops. So we put on extra layers and headed upward to Peel Ridge where conditions were not at all summery. 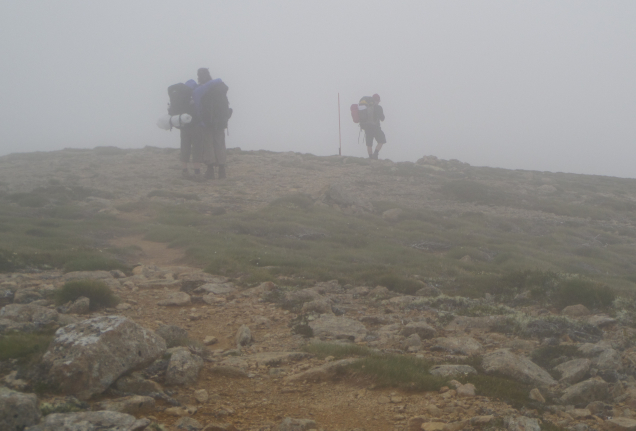 Our route to Balloon Hut took a U-shaped path down past Lake Peel, barely visible through the mist. 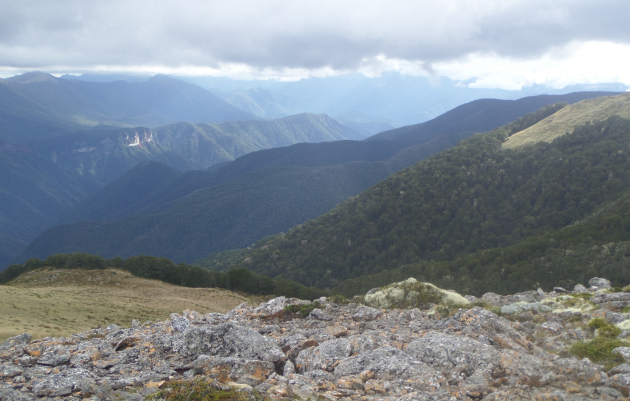 The other end of the U opened out into what should have been expansive views toward Karamea to the south-west and the Arthur/Wharepapa Range to the south and east. Fortunately a few gaps opened up in the cloud to give glimpses of spectacular, steeply rising bluffs above the Leslie River and layers of distant blue ranges. We arrived at a busy Balloon Hut (serviced, 14 bunks) to find dinner preparations in full swing – and were pleased to discover bunks were still available. Two other visitors set up tents and another chose to sleep in the wood shed. The Easy-Medium group also overnighted at Balloon; a good fire took the chill off a cool, drizzly evening. Apparently the temperature in the area had reached 35 degrees the previous weekend. Because our walk in had taken rather longer than the suggested 4 hours (a relaxed 5 ½ hours for us) we mulled over our options for Sunday and Monday – we had to be back at the van at noon on Tuesday to meet the Medium group. The new plan was for a day walk on Sunday to Salisbury Lodge followed by the Potholes walk and then back to Balloon. On the way to Salisbury Lodge we found the Easy-Mediums just leaving Bishop’s Cave and they pointed out the entrance – which we might otherwise have missed. We joined them at the lodge for lunch, then set out on the Potholes walk, a 3km circuit featuring sinkholes, undulating hills, and Sphinx Valley Cave. Back at Balloon we had the hut to ourselves. 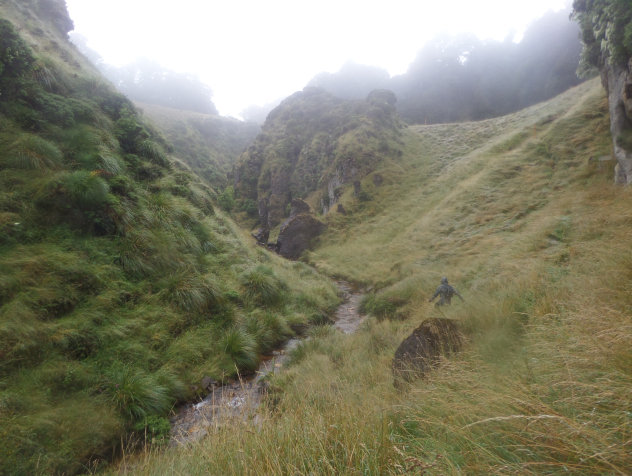 Dinner was prepared in a most leisurely fashion as low cloud continued to billow up and over the ridge. 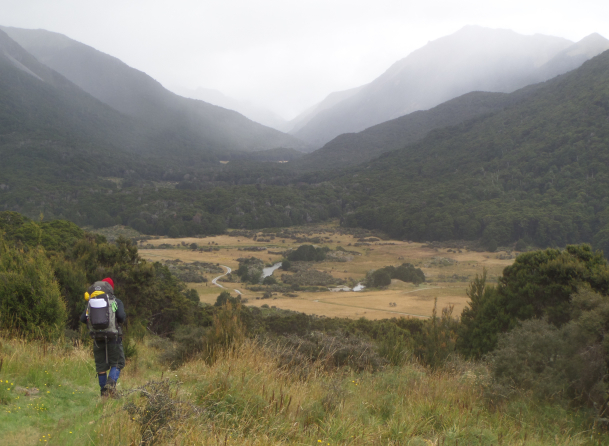 On Monday we retraced our steps from Balloon Hut to the Cobb Valley Campsite in brighter weather, though southern views were still hidden by misty cloud. We took care as we passed through the beech forest on the way down to Cobb Reservoir not to linger near possible wasp nest sites. Two of our party were stung on the way in when we paused at a small bridge. Our journey out was quicker than on the way in (more downhill) and we arrived at the van around lunchtime. A relaxing afternoon ensued. We opted to spend the night at Trilobite Hut near the campsite, as did the Easy-Mediums. But everyone else then decided that tents and flies were the way to go and soon there were six in front of the hut and another down the road by the campsite. A very quiet night in the hut for me! Some keen people took a refreshing (quick) dip in the nearby Cobb River. The fire was lit to dry out damp clothing. Three local wekas made their presence very obvious, poking through unattended belongings, jumping up onto the picnic table, and chasing each other around the hut. Monday night’s dinner was our own choice of de-hy meals. While waiting to add the just-boiled water to mine, the pourer accidentally sloshed some over their hand and then jerked reflexively, splashing hot water onto my leg. I let out a screech, alarming everyone sitting inside, and chucked half the contents of my dry de-hy meal over the ground. Two wekas raced up to investigate. I swept up the remains and tossed them into the fire, then went down to the river and immersed my leg for 10 minutes or so. No real ill-effects, but next time – stand further back. The Medium group arrived ahead of schedule on Tuesday morning and then we were back on the road to Picton with a lunch stop at Motueka. Thanks to everyone for a relaxing long weekend in a spectacular part of New Zealand – keen to return one day!